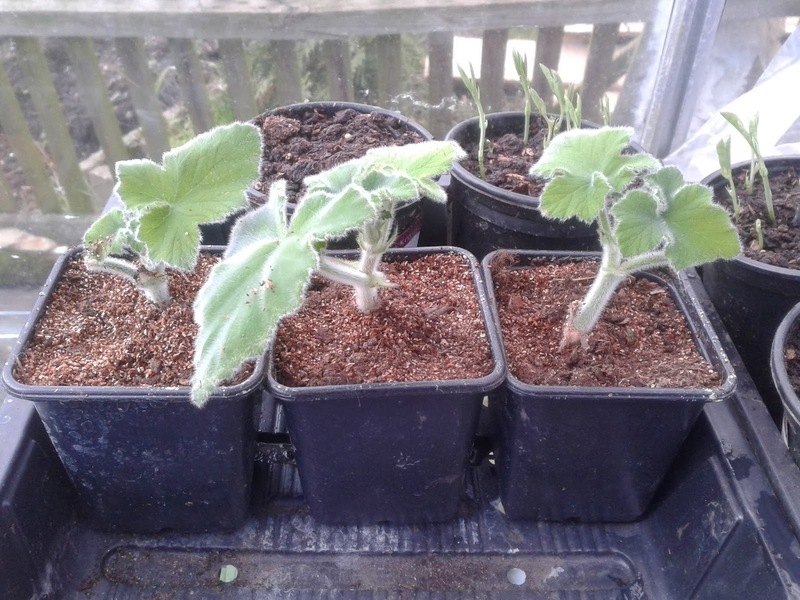 What can be more satisfying than your own plant propagation, whether it’s the first seedlings of the year appearing or noticing your cuttings of your prize plant have rooted. This weekend was blissfully spent sowing the early vegetables of the year – potting on my Pelargonium tomentosum cuttings and taking the first basal cuttings from my Chrysanthemums. Admittedly I cannot put down this years successful early propagation to just green fingered skill and knowledge, our incredibly mild winter and early sunny days have benefited all horticulturalists and each day I think we all cross our fingers in the hope that winter is behind us. However much I love a crisp snowy winter if it hasn’t arrived in December or January I’m not interested. Basking in the 24 degree heat of my greenhouse yesterday couldn’t have made me happier. Majority of my seedlings this year have germinated without base heat, along with my autumn Pelargonium cuttings. This year I put my cuttings into a small seed tray filled with a light seed compost. They remained fairly dry throughout the winter and were placed a small glass container in my greenhouse. Regularly opening the container during the day to prevent humidity the causes Botrytis. The roots on these have formed quickly and unlike plug trays these loose, thick open root balls will spread quickly into their larger pots. P.tomentosum grows at such a rate that I’ll have large plants by late spring. I’m also trailing pea seedlings with and without ‘pea and bean booster’ – these soaked seeds should germinate within 14-21 days – I’ll interested to see whether the booster enhances this rate of growth. Having sown well over 100 seeds I hope to have enough peas this year – as usually my partner harvests them direct from the plant for a quick snack – hence making our yield deplete very quickly! My new perennial vegetable patch and kitchen garden will hopefully take shape this year and provide us with season long greens and herbal remedies. Lemon verbena tea with fennel and honey being my favourite – the leaves of the Lemon verbena can be used fresh or dry. This evening roasted with butter the Jerusalem artichoke tasted fabulous – only harvesting ¼ of the crop – taking care to keep the rest under control. The best part of early spring is forgetting just how many bulbs you planted in October/November and being pleasantly surprised as they all push through the soil surface – the paintbrush shoots of the Crocus or the curled tongues of the Tulip leaf – magic!